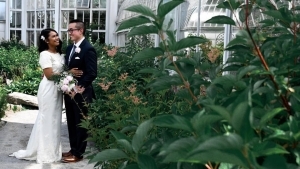 On Sunday, July 2nd, my cousin and her fiance’ became Mr. & Mrs at the Anna Scripps Whitcomb Conservatory; one of my most favorite places in Detroit. The Conservatory has served as my winter escape–the Tropical and Palm House transport me to my birthplace, The Philippines. When my cousin told me they chose the Conservatory to have their ceremony, I was extremely excited for them. The weather was perfect, and with it being a holiday weekend, hundreds of people were on the Isle (Belle Isle). The ceremony was an intimate one and the bride wore a dress that was sewn by her mom. While they shared their vows, visitors tried to get a glimpse of the bride and groom through the glass and plants separating The Showroom from the Palm Room. After the ceremony was over, we headed to the lawn and the koi pond to take photos. After the photos, we headed to The Whitney to enjoy dinner in one of the Whitney’s private rooms where Iris gave us wonderful service and historical tidbits. 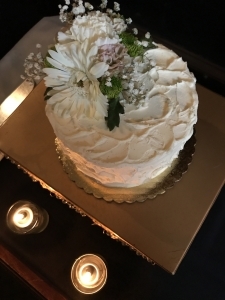 The wedding cake was from Love & Buttercream.